MONTPELIER, Vt – Vermont is often recognized for having some of the best freshwater fishing in the Northeast. The Vermont Fish & Wildlife Department says one of the best ways to learn about the state’s fishing opportunities is to check out the 2018 Vermont Fishing Guide & Regulations available free from its district offices and license agents throughout the state. An online version also can be found at www.vtfishandwildlife.com. The “Fishing Guide” has regulations such as season dates, daily limits and length limits for lakes, ponds and streams throughout the state. The rules vary by water body which are listed in the Index of Lakes and Ponds and Index of Rivers and Streams. Both indexes also reference ten general regulation tables near the back of the publication. The fifteen pages of detailed maps of the state contain regulations specific to sections of streams, the locations of state fishing access areas, state wildlife management areas as well as other public lands, and the back roads leading into these areas. 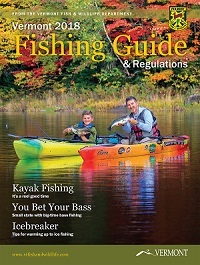 The 2018 edition also has feature articles on kayak fishing, fishing tips for smallmouth and largemouth bass, icefishing how-to information, tips on how to handle fish when catch-and-release fishing, and aquatic invasive species. The 2018 Vermont Fishing Guide & Regulations is available free from Vermont Fish & Wildlife district offices and at stores where fishing licenses are sold in Vermont.